USP22, Nuclear factor-κB (NF-κB), Spinal cord injury (SCI), Inflammatory, Microglia. In most SCI cases, traumatic spinal cord injury is considered to be the most prevalent and serious feature in the Spinal Cord Injury (SCI), that is related to causing neurological dysfunction [1,2]. Moreover, it is also regarded as a severe risk to the quality of life of a person, probable of causing high financial strains in the case of prognosis. Drawing from a new report by WHO, it is estimated that close to 500,000 people have suffered SCI yearly. Also, those with SCI complication are two to five times probable to prematurely die, in which the worst survival rates are reported in countries of low- as well as middle-incomes. SCI leads to mechanical injury and secondary biochemical or physiological reactions which can stimulate damage of spinal cord tissues along with other connected neurological dysfunction . Presently , SCI’ pathophysiology consists of both primary along with secondary injuries. First, primary injury relates to the foremost unconscious injury owing to express tissue damage as well as transformation of energy. On the other hand, secondary injury involves several biochemical processes that occur hours or weeks following SCI which additionally damages the tissues within or surrounding the original site of injury. It is among the serious causes of SCI pathology. Inflammation linked to activation of microglial is usually employed in representing neuronal inflammation, which is likely to lead to SCL’s second injury. Neuronal inflammation may be stimulated by microglia that is activated via the pathway of Nuclear Factor-κB (NF-κB), which significantly contributes in inflammation and immune response. Besides, it may also encourage secretions of IL-1β, IL-6, IL-18, and TNF-α with additional inflammatory cytokines as well . Activation of NF-κB occurs alongside phosphorylation of p65. Therefore, sensing extents of expression of p-p65 can expose NF-κB activation. It is illustratable that reactive microglia might have critical role of neuroprotective and reparative in the first SCI stages. Afterwards, they may damage axonal regeneration as well as functional recovery. It means that the suitable control for microglia activation in suppressing inflammation together with immune response extension is a primary approach in the SCL treatment. In this case, the signaling events causing activation of microglia subsequent to SCI need further research. As commonly established, TNF (Tumor Necrosis Factor)- Receptor-Associated Factor (TRAF) 2 as well as TRAF 6 are basic adaptor proteins for signaling pathway of NF-κB. Additionally, TRAF 6, mainly owing to their polyubiquitination, realise that their activation together with functions in TNF-α and IL (interleukin)-1β-induced activation of NF-κB . Nevertheless, the mechanism regulating the TRAF 6 deubiquitination after SCI is still not comprehensible. In the past, it has been shown that the TRAF 6s’ deubiquitination via Deubiquitinating enzymes (DUBs) noticeably prevents TNF-α as well as IL-1β-mediated activation of NF-κB [7,8]. Ubiquitin Specific Protease 22 (USP22), which is a homolog to murine Unp with 2 tissue specificity to plasmic isoforms, is a member of the deubiquitin enzyme family . Nevertheless, it is indistinct on whether USP22 is entailed in the activation of microglia as well as ensuing SCI neuronal inflammation via NF-κB. For this current investigation, our examination recognized USP22 expression together with distribution in the spinal cord subsequent to traumatic SCI on mature rats, in view of its association with NF-κB in activated microglia. They may assist us in comprehending USP22’s function as well as its roles in the activation of microglia as well as successive neuronal inflammation subsequent to SCI. The experimentations had been affirmed by Tongji Medical College’s ethics committee. The mature male Sprague-Dawley rats (n=60, average weigh=250 g) had been acquired from the Department of Animal Center, Huazhong University of Science and Technology. Rats that had been selected were then adapted for a period of between 1 and 2 w. Then, they had been placed at a temperate range of 22 ± 3°C as well as inundated humidity under 12 h of light and dark cycle. Plenty of water as well as food had been provided. The rats were all arbitrarily put into 2 distinct groupings: sham operation (n=6) as well as contusion injury (n=54). In these sub-groupings, 48 rats (sham and every time point subsequent to SCI: n=6 × 8) had been modeled as western blot analyses, together with 24 rats (sham and every time point subsequent to SCI: n=3 × 8) had been modeled as frozen cross-sections for immunohistochemistry Dorsal laminectomies at the ninth thoracic vertebra (T9) level were conducted in anesthesia using 10% chloral hydrate (3.5 ml/kg, i.p.) . Ketoprofen (5 mg/kg) had been given to reduce the pains and discomforts resulting from post-surgery. The contusion injury grouping had been carried out by use of the NYU impactor in 10 g 9.5 cm of force. Then, the stretched out muscles together with the skin had been sewed up in layers using 4.0 silk sutures as well as staples subsequent to discoloration. Animals in the sham grouping had been freeze and prepared surgically without reception of SCI surgery. They were let to recuperate in new cages under 30°C heating pad put away from one another. Then, postoperative therapy involved 2 ml saline (s.c.) for rehydration, ketoprofen (5 mg/kg, i.p.) to reduce pain resulting from the post-surgery, as well as discomforting baytril (0.3 ml, 22.7 mg/ml, s.c., twice every day) to inhibit infection of the urinary tract. The rats’ bladders had physically been expressed twice each day until reflex bladder unwilling function had been regained. Bedding had been modified habitually, and the cage kept dry and dirt free. The animals had been forfeited in 7 sub-groups at 6, 12 h, 1, 3, 5, 7, and 14 d subsequent to injury. Ten animals had been utilized as sham controls. All the necessary efforts had been made to reduce the number of rats utilized as well as their distress. In acquiring samples needed for the Western blot analysis, sham or injured spinal cords rats had been extracted and cryopreserved at -80°C for later. The section of the spinal cord that extends from 5 mm caudal to 5 mm rostral in the epicenter of injury was instantly eliminated. In making the lysates, the ice-covered samples of spinal cord had been chopped up using an eye scissors on the ice. Then, these samples had been delivered fairly in the lysis buffer (50 mmol/l Tris, 1% NP-40, pH 7.5, 1% SDS, 5 mmol/l EDTA, 1% sodium deoxycholate, 1 mmol/l PMSF, 1% Triton X-100, 1 mg/ml leupeptin, as well as 10 mg/ ml aprotinin) then they were illuminated through centrifugation for about 20 min in a microcentrifuge at 4°C. Subsequent to the establishment of its protein concentration using the Bradford assay (Bio-Rad), the resultant supernatant (50 μg of protein) had been conventionally established to SDS-Polyacrylamide Gel Electrophoresis (PAGE). After that, the detached proteins had been relocated to the polyvinylidine difluoride membrane (Millipore) using a transfer equipment at 350 mA for about 2.5 h then later inhibited using 5% non-fat milk. Subsequent to this, the membrane had been nurtured using principal antibodies alongside USP22 (anti-rabbit, 1:1000; Santa Cruz), p-p65 (antirabbit, 1:1000; Cell Signaling), p65 (antirabbit, 1:1000; Cell Signaling), as well as GAPDH (antirabbit, 1:1000; Santa Cruz). Subsequent to incubation with an anti-mouse horseradish peroxidase conjugated secondary antibody, the protein had then been envisaged using an improved chemiluminescence system (ECL, Pierce Company, USA). Subsequent to the various time decided, the group of sham as well as the injured rats had incurably been deadened then perfused via the ascending aorta with saline then followed by 4% paraformaldehyde. Following perfusion, the sham grouping and injured spinal cords group had been post-fixed in 4% of paraformaldehyde for a period of 12 h, then sucrose-dehydrated. Following sucrose solution treatment, spinal cords had been put into the O.T.C. compound. Subsequently, they had been cut into 4.5 μm frozen cross-sections at two levels of spinal cord, then, prepared, before being investigated. All sections had then been inhibited using 10% Donkey serum and 0.3% Triton X-100 as well as 1% (w/v) bovine serum albumin (BSA) for about 2 h at RT, then kept warm all night at 4°C under anti-USP22 antibody (antirabbit, 1:100; Santa Cruz), after incubation in biotinylated secondary antibody (Vector Laboratories, Burlingame, CA, USA). Also, staining had been envisaged using DAB (Vector Laboratories). Then, the cells with stout or moderately brown discolors had been regarded as the positive cells, while those without staining had been considered to be negative. Likewise, the cells with fragile staining had been separately scored. In view of double immunofluorescent staining, some sections had been eliminated from the freezer then kept warm in an oven at 37°C for about 40 min. The sections had then been kept warm under rabbit polyclonal primary antibodies for USP22 (1:100), NeuN (neuron marker, 1:100), DAPI (nucleus marker 1:1000), GFAP (astrocytes marker, 1:100), as well as IBa1 (microglia marker, 1:100). In conclusion, the sections had been kept warm with both the primary antibodies all-night at 4°C, and afterward with a mixture of CY2- along with CY3-conjugated secondary antibodies for a period of about two hours at 25°C. The sections that were stained had been investigated using a Leica Fluorescence microscope (Germany). Glial cultures had been made ready out of the postnatal day-1 Sprague-Dawley animals’ spinal cords . The meninges as well as blood vessels had been eliminated from their spinal cords, then the tissue had been lightly chopped and detached enzymatically using 0.25% Trypsin-EDTA for about 20 min at 37°C. Spinal cord tissues had been mechanically triturated in the Dulbecco Modified Eagle Medium/Ham’s F12 (DMEM/ F12; Gibco) with 10% Fetal Bovine Serum (FBS; Gibco) as well as 2% Penicillin/Streptomycin (P/S; Gibco). They were later on plated on poly-l-lysine coated plates. Following culturing for 21, microglia had then been separated from the glial cultures through mild trypsinization (0.25% Trypsin- EDTA was diluted in 1:3) for between 20 and 50 min. Afterward, DMEM/F12 with 2% P/S had been added up to the separated Spinal Cord Microglia (SCM) . SCM had then been additionally tagged using a PE-conjugated anti-CD11b+ antibody (BD Biosciences, San Jose, CA, USA) subsequent to an anti-PE antibody conjugated to a magnetic bead. Magnetically tagged CD11b+ cells had been separated by use of MS columns as per the Miltenyi MACS protocol. As earlier stated, the method causes a 97% pure population of CD11b+ cells . The separated CD11b+ cells will afterward be labeled as “microglia.” The separate microglia cells had then been cultured once more in DMEM/F12 with 2% P/S at 37°C in 5% CO2. The cells of passages 3-4 had been utilized for all of the experimentations. For treatment of hypoxia, SCM had been set in a sealed experimental chamber of hypoxia (Billups- Rothenberg, San Diego, CA, USA) with a mixture of gas containing of 95% N2/5% CO2. The cell culture medium had been substituted to the serum-free DMEM/F12 culture medium. One of the six-well plates of microglia had been matched for about 24 h without serum. It was then kept warm in serum’s presence, as well as LPS’s presence/absence under an incubation density of 0, 0.01, 0.1, 1, 10, 20 μg/ml. LPS-induced microglia had then been collected for Western blot analysis. We, therefore, select the density of incubation of LPS which had made expression of p-p65 most visibly distorted to keep microglia warm for 1, 3, 6, 12, or 24 h. Then, LPS-treated microglia was collected awaiting the Western blot analysis. HA-USP22 plasmid had been obtained from the Public Protein/ Plasmid Library (PPL) whereas siRNA transfection had been acquired from GenePharma. Transient transfection of plasmid together with siRNA had been carried out by use a protocol suggested by the manufacturer. The 3 siRNA series that had been acquired online from GenePharma siRNA library had been expressed alongside USP22. The USP22 siRNA series was detected as: 5’-CGUCAAAGGUGAUGACAAUTT-3’. Negative control, 5’-AUUGUCAUCACCUUUGCAGTT-3’. The cells had been transfected using 100 nmol/l of siRNA duplexes by use of Lipofectamine 2000 (Invitrogen, Carlsbad, CA) and as per the manufacturer’s procedure. TNF-α as well as IL-1β in the SCM media had been measured through solid-phase sandwich ELISA (R&D systems, Mannheim, Germany) and as per the procedures of the manufacturer. All of the samples had been streamed in replicates. The spinal cords had been separated then homogenized in 300 μL PBS. The homogenates had been congealed at -20°C all night and had been centrifuged at 12,000X g at 4°C. Concentration of protein had also been quantified in the supernatants by use of the BCA approach (Pierce, Rockford, IL, USA). As well, 1 mg of protein for every group had been utilized for ELISA assay. The samples as well as standards had been kept warm on plates covered with anti-TNF-α together with anti-IL-1β antibodies (n=5 per group). The Biotinylated antibody had been added to mixtures of bound cytokines. In measuring the binding of the secondary antibody, streptavidin-peroxidase conjugate as well as substrate (tetramethylbenzidine) had been added. Following stoppage of the reaction through adding of citric acid, absorbance had been quantified at 450 nm. The concentrations had been established from a standard curve. In examining the temporal patterns of the expression of USP22 in the spinal cord, the rats had been euthanized in various time points subsequent to SCI or sham operations. USP22 expression had been investigated using the Western blot analysis. From Figures 1a and 1b, USP22 started decreasing at 6 h subsequent to SCI. Then, it was recorded to have been at its lowest in the third day (P<0.05). This trend slowly stepped up to the sham level operation group. From this data, it signifies that the level of USP22 protein could probably be downregulated subsequent to SCI. Figure 1. 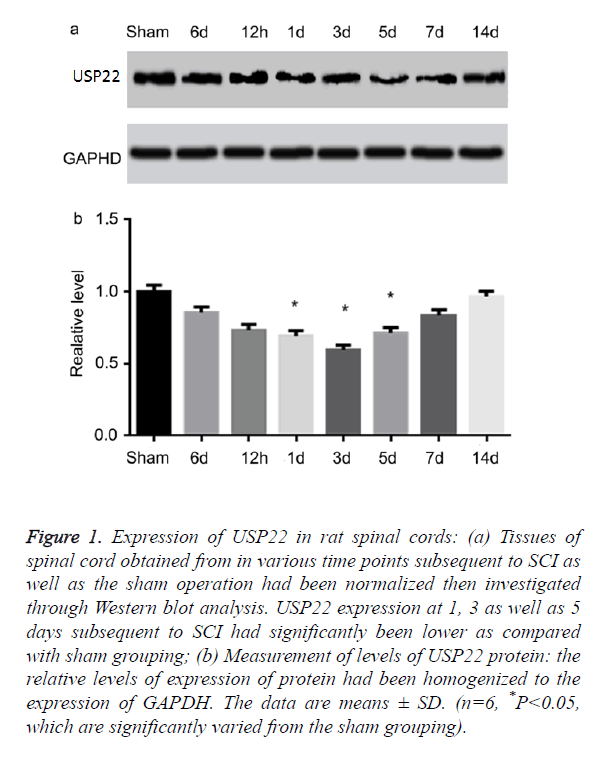 Expression of USP22 in rat spinal cords: (a) Tissues of spinal cord obtained from in various time points subsequent to SCI as well as the sham operation had been normalized then investigated through Western blot analysis. USP22 expression at 1, 3 as well as 5 days subsequent to SCI had significantly been lower as compared with sham grouping; (b) Measurement of levels of USP22 protein: the relative levels of expression of protein had been homogenized to the expression of GAPDH. The data are means ± SD. (n=6, *P<0.05, which are significantly varied from the sham grouping). AS illustrated in Figures 2a and 2b, the level of protein in p-p65 improved at 6 hours following SCI. It then achieved its peak on the third day (P<0.05). These observations were, however, not consistent with the temporal patterns of USP22 expression. Moreover, the level of protein for p65 had not been altered. The results impelled us to investigate if USP22 is implicated in inflammation following SCI. Afterwards, we performed a double-labeled immunofluorescent staining to investigate the USP22 colocalization with p-p65 in the damaged spinal cord. USP22’s colocalization as well as p-p65 had been examined for three days following SCI (data not displayed). The results show that USP22 was implicated in the spinal cord inflammation following SCI. Figure 2. p-p65 improved in the spinal cord; (a) Tissues of the spinal cord obtained from the animals in a range of time points following SCI as well as sham operation had been normalized then investigated through the use of Western blot analysis. p-p65 expression had been augmented at 6 h following SCI; (b) Measurement of p-p65 levels of protein: the relative expression of protein levels had been homogenized to the expression of GAPDH. Data includes means ± SD. (n=6,*P<0. 05, which is significantly varied from the groupings of sham). Further, we utilized simulation of LPS to stimulate primary microglia activation. As illustrated in Figures 3a and 3b, USP22 levels of expression had been noticeably decreased subsequent to 6 h of LPS stimulation, relative to naive cells (P<0.05). It is renowned that TRAF 6 contributes fundamentally in the activation of NF-κB. Thus, the Western blot had been carried out to additionally quantify the p-p65 expression profiles as well as TRAF 6. Results of this process indicated that p-p65 as well as TRAF 6 protein levels had been low in the naïve cells. However, both of them had been extremely augmented following treatment of LPS for 6 h (Figures 3c-3e) (P<0.05). Figure 3. 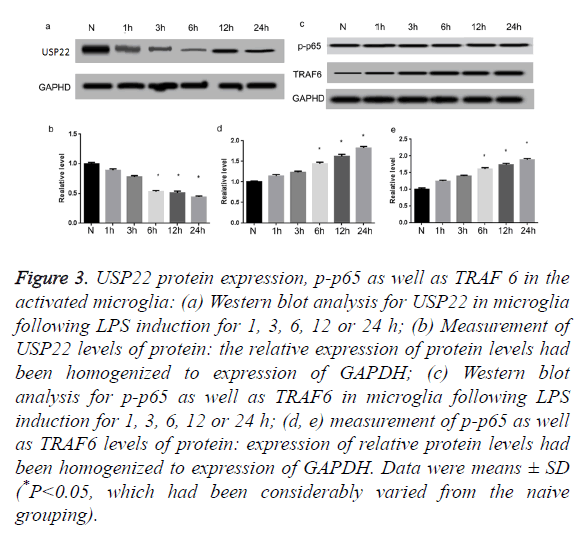 USP22 protein expression, p-p65 as well as TRAF 6 in the activated microglia: (a) Western blot analysis for USP22 in microglia following LPS induction for 1, 3, 6, 12 or 24 h; (b) Measurement of USP22 levels of protein: the relative expression of protein levels had been homogenized to expression of GAPDH; (c) Western blot analysis for p-p65 as well as TRAF6 in microglia following LPS induction for 1, 3, 6, 12 or 24 h; (d, e) measurement of p-p65 as well as TRAF6 levels of protein: expression of relative protein levels had been homogenized to expression of GAPDH. Data were means ± SD (*P<0.05, which had been considerably varied from the naive grouping). Spinal Cord Injury (SCI) largely transpires in young adults with a fairly high rate of disability. SCI brings about great damage to the patients’ psychology as well as physiology . Therefore, further researches of SCI pathophysiology following SCI need to be undertaken. Secondary SCI denotes progressive and self SCI which majorly takes place in young adults and presents critical damage of the spinal cord tissues thereby causing a relatively high rate of disability. It might also lad to great harm as a result of multiple factors based on the primary injury . As well as the patients’ psychology and physiology effects . Therefore, neuronal inflammation stimulated by activated microglia by means of the pathway NF-κB is the significant contributing factor in secondary injury . The parenchymal injury of the secondary damage after SCI is more than just the primary SCI. Primary injury is regarded to be irreversible. Nevertheless, the successive secondary injuries are reversible . The results offer the probability for researchers to investigate restoration and regeneration of SCI. Early interventions in the event of secondary injury might help in improving the living situations of the spinal cord tissues, as well saving the critical anatomical structures for functional regeneration. A study carried out by Cartier et al. showed that when SCI takes place, microglia in SCI areas as well as in the surroundings might react because of the activation. Moreover, excessive activation of microglia might generate many neurotoxic inflammatory cytokines as well as arbitrate the immune inflammatory responses. This can worsen the damage to the surrounding tissues. It is also concerned with the pathological processes of secondary injuries. Thus, a detailed comprehension of the molecular mechanism of activation of microglia together with neuronal inflammation response following SCI ought to support examination of the early intervention approaches of secondary injuries. We found out from the results of this study that that the levels of USP22 protein had been downregulated following traumatic SCI through performance of Western blot analysis. Expression and distribution of USP22 reduced in the white matter through immunohistochemical staining. Moreover, we realized that the USP22 percentage positive cells in microglias had significantly been decreased. Protein levels of p-p65 had been incompatible with the temporal expression of USP22 patterns. Therefore, we recognize that microglias are in a state of rest or sleep under the normal situations in the CNS . When the nervous system is induced by trauma, the microglias are extremely activated. It stimulates changes in form, role as well as immune phenotype . The extreme amounts of microglias activation might produce immune response apply the phagocytic influences of macrophages as well as discharge many inflammatory cytokines including IL-1β, IL-6, IL-18 as well as TNF-α. These inflammatory cytokines may play a significant role to the inflammatory response as well as augment neuronal injury as well as apoptosis. Therefore, it cause or aggravate secondary injury . Additionally, USP22 belongs to Ub- Specific Peptidases (USPs), representing the principal sub-class of Deubiquitinating enzymes (DUBs). Ubiquitination is a process that can be reversed and it contributes in the NF-κB signaling pathway activation, which is a crucial signaling pathway for activation of microglia as well as secretion of inflammatory factors. Thus, we regard USP22 to be able to take part in microglia activation-mediated inflammation via NF-κB following SCI. In verifying the actuality of the findings in vivo study, we conducted the model of microglia activation cultured in vitro. LPS had been utilized in inducing microglias activation. Compatible with the inverse relationship between USP22 and p-p65 levels in the spinal cord, USP22 had noticeably been decreased as well as p-p65 increasing in LPS-induced microglias. Additionally, we realized that the levels of protein of TRAF6, which is critical in E3 ubiquitin ligase to regulate signaling pathway of NF-κB had been augmented. It was in agreement with the alterations in the p-p65. The results show that low levels of USP22 can encourage p-p65 as well as TRAF 6 expressions following SCI. This result is also in line with the previous literatures that had reported that USP22 can possibly be a negative regulator of TRAF 6 activity . We further indicated that USP22 can be silenced effectually in promoting p-p65 and TRAF 6 upregulation in LPS-induced activated microglias. Furthermore, the levels of secretion of TNF-α along with IL-1β can significantly be augmented following treatment with USP22 knock-down. However, this was leveled subsequent to transfecting HA-USP22 plasmid primary cultured microglia. This also illustrates that USP22 downregulation can facilitate neuroinflammatory response in the secondary injuries through NF-κB activation following SCI. In the standard state, NF-κB dimmers (p65/p50) are in an inactive state through combination with one of the inhibitory factors of IκBα, IκBβ, or IκBε. In regards to IκB ubiquitination it might be isolated from p65/p50, thereby causing NF-κB activation . In this study, expression of USP22 had been downregulated in SCI rat model. Thus, we consider that USP22 downregulated in microglia entourages IκB ubiquitination through attenuation of deubiquitination of TRAF 6 following SCI. It activates pathway of NF-κB and encourages response of inflammatory. Summarily, this study has provided the foremost confirmation that USP22 reduces in microglial cells after critical SCI in rats. Additionally, we found significant evidence for understanding the downregulation of expression of USP22 which might encourage activation of microglia and successive neuronal inflammation following SCI. Nonetheless, there are still several unclear mechanisms which can help in further understanding the function of USP22 in the LPS-induced activation microglia model. Therefore, further studies are needful in delineating accurate molecular mechanism of USP22 in NF-κB mediated inflammatory response following SCI. Huang S, Liu X, Zhang J. Expression of peroxiredoxin 1 after traumatic spinal cord injury in rats. Cell Mol Neurobiol 2015; 35: 1217-1226. Ren J, Mao X, Chen M, Zhang W, Liu Y. TCTP expression after rat spinal cord injury: implications for astrocyte proliferation and migration. J Mol Neurosci 2015; 57: 366-375. Sawada M, Kato K, Kunieda T. Function of the nucleus accumbens in motor control during recovery after spinal cord injury. Science 2015; 350: 98-101. Ambrozaitis KV, Kontautas E, Spakauskas B, Vaitkaitis D. Pathophysiology of acute spinal cord injury. Medicina (Kaunas) 2006; 42: 255-261. Liu G, Fan G, Guo G, Kang W, Wang D. FK506 Attenuates the inflammation in rat spinal cord injury by inhibiting the activation of NF-κB in microglia cells. Cell Mol Neurobiol 2017; 37: 843-855. Hadweh P, Habelhah H, Kieff E. The PP4R1 subunit of protein phosphatase PP4 targets TRAF2 and TRAF6 to mediate inhibition of NF-kappaB activation. Cell Signal 2014; 26: 2730-2737. Martinez-Forero I, Rouzaut A, Palazon A. Lysine 63 polyubiquitination in immunotherapy and in cancer-promoting inflammation. Clin Cancer Res 2009; 15: 6751-6757. Yasunaga J, Lin F C, Lu X. Ubiquitin-specific peptidase 20 targets TRAF6 and human T cell leukemia virus type 1 tax to negatively regulate NF-kappaB signaling. J Virol 2011; 85: 6212-6219. Zhou D, Liu P, Sun DW. USP22 down-regulation facilitates human retinoblastoma cell aging and apoptosis via inhibiting TERT/P53 pathway. Eur Rev Med Pharmacol Sci 2017; 21: 2785-2792. Zhang J, Cui Z, Feng G, Bao G, Xu G. RBM5 and p53 expression after rat spinal cord injury: implications for neuronal apoptosis. Int J Biochem Cell Biol 2015; 60: 43-52. Baskar JSJ, Todd KG, Winship IR. Reduced inflammatory phenotype in microglia derived from neonatal rat spinal cord versus brain. PLoS One 2014; 9: 99443. Nikodemova M, Watters JJ. Efficient isolation of live microglia with preserved phenotypes from adult mouse brain. J Neuroinflammation 2012; 9: 147. Stein DM, Pineda JA, Roddy V, Knight WA. Emergency neurological life support: traumatic spine injury. Neurocrit Care 2015; 23: 155-164. Kingwell K. A new approach to respiratory recovery after spinal cord injury? Nat Rev Neurol 2011; 7: 473. Jin X, Yamashita T. Microglia in central nervous system repair after injury. J Biochem 2016; 159: 491-496. Antar V, Baran O, Yuceli S. Assessment of the neuroprotective effects of the acetylcholinesterase inhibitor Huperzine A in an experimental spinal cord trauma model. J Neurosurg Sci 2015. Cartier N, Lewis CA, Zhang R, Rossi FM. The role of microglia in human disease: therapeutic tool or target? Acta Neuropathol 2014; 128: 363-380. Ziv Y, Avidan H, Pluchino S. Synergy between immune cells and adult neural stem/progenitor cells promotes functional recovery from spinal cord injury. Proc Natl Acad Sci USA 2006; 103: 13174-13179. Nakajima K, Kohsaka S. Microglia: neuroprotective and neurotrophic cells in the central nervous system. Curr Drug Targets Cardiovasc Haematol Disord 2004; 4: 65-84. Magni P, Ruscica M, Dozio E. Parthenolide inhibits the LPS-induced secretion of IL-6 and TNF-alpha and NF-kappaB nuclear translocation in BV-2 microglia. Phytother Res 2012; 26: 1405-1409. Li Z, Hao Q, Luo J. USP4 inhibits p53 and NF-κB through deubiquitinating and stabilizing HDAC2. Oncogene 2016; 35: 2902-2912.